Hyderabad's new Rajiv Gandhi International Airport, located 22 km (14 miles) from the city, is well connected internationally. International carriers operating from the airport are Air India, British Airways, Emirates, Malaysia Airlines, Oman Air, Qatar Airways, Saudi Arabian Airlines, Silk Air, Etihad Airways and Thai Airways. Domestic connectivity is also very good. Air India, Air India Express, Indian Airlines, Indigo Airlines, Jet Airways, JetLite, Kingfisher Airlines and SpiceJet operate from here. Two major water bodies flow through Hyderabad - the Musi river and the Hussain Sagar Lake. The river flows west to east, a few kilometres to the south of the Lake. The Old city, which has most of the monuments Hyderabad is famed for, lies on the south bank of the Musi. Secunderabad, the twin-city to Hyderabad, has good parks and restaurants and the cantonment area, and lies to the north-east of the Hussain Sagar lake. The New city, which houses administrative offices, lies on the north bank of the river, to the east and south-east of the lake. 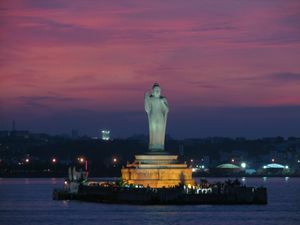 Punjagutta to Gachibowli is a vast region to the west and north-west of Hussain Sagar, on the north bank of the Musi. Punjagutta and Ameerpet have enormous shopping areas. Banjara Hills and Jubilee Hills are where Hyderabad's elite live, and these areas contain some good parks and restaurants. Gachibowli and Hi-tech city are 9 km to the west of the new city, and house the campuses of technology and business process outsourcing (BPO) firms. Hyderabad has a tropical climate. Average temperatures range between 39°C and 21°C in September and October. Though the weather in September is cloudy with plenty of rain in the early part of the month, late September marks the end of the south-west monsoon. 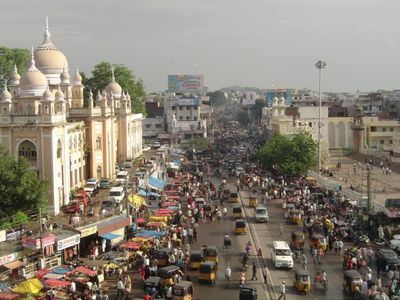 Hyderabad, the capital and the largest city of Andhra Pradesh, has over 7 million people. A little over 56% of the population are Hindus. Muslims comprise around 41% of the population and are predominant in and around the Old City. Buddhists, Christians, Jains, Parsis, and Sikhs, make up the remaining communities of the city. Telugu is the official state language (also one of the India's three living classical languages), and Urdu is the second official language of Hyderabad. Hindi and English are also widely spoken in Hyderabad. English signage is common. Though Hyderabad is the State capital, the varied influences on its culture have given it an identity different from the rest of Andhra Pradesh. It is often thought of as the meeting ground between North and South India. The Old city is conservative and it is important to dress in a culturally appropriate manner in this part of the city. The New city and Secunderabad, where people have moved in from various parts of the country, are more cosmopolitan. Hyderabadi cuisine is a legacy of the Nizam's of Hyderabad and contains Mughlai, Turkish, and Arabic influences, as well as those of the native Telgu and Marathwada (now Maharashtra) cultures. The technique of 'dum'- where the dish is sealed with dough and the ingredients left gently simmering over a slow fire to increase the absorption of aromatic spices- is central to many Hyderabadi dishes. Hyderabadi cuisine offers a mouth-watering array of non-vegetarian and vegetarian dishes, of which Hyderabadi Biriyani is the most famous, with 26 or more varieties in existence. Other dishes Hyderabad is famous for include Pathar-ka-Ghosht (lamb seared on stone), Paaya (Lamb-marrow stew), and Haleem (a seasonal, slow-cooked meat and rice porridge). There is only one time zone across all of India. India also does not observe any form of daylight saving time or any other seasonal adjustments to time, although there are plans to change this. The Indian Standard Time (IST) is Greenwich Mean Time (GMT) plus 5.30 hrs. Traffic drives on the left side of the road in India. To rent a vehicle, you will need a valid driver's license (in English) from your home country or an international Driver's Permit. Reliable radio taxi operators that you can call or book online for transport in Hyderabad include Meru, Easy Cabs, Orange Cabs, Sky Cabs, and Yellow Cabs. 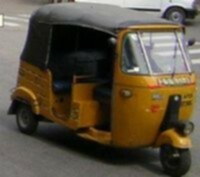 Metered taxis, auto rickshaws and buses can be used for travelling in and around the city. Local trains are also available to a few places. However, unless you are a seasoned traveller in India, it is advisable to avoid public transport or hailing taxis or auto rickshaws from the streets. Please use pre-booked radio taxis or transport arranged by your hotel, or use the travel desk provided by Royal Travels. Banks are generally open 10 a.m. to 4 p.m. from Monday to Friday, and till 12 on Saturdays, except on public holidays. Automatic teller machines (ATMs) are widely available in Hyderabad. There is also an ATM in the premises of the Novotel HICC complex. All major credit cards can be used at banks, hotels and some retail stores. For information on vaccinations and other health information, click here. Don’t carry your credit card, travel tickets and money together - leave spare cash and valuables in a safe place, such as the electronic safe in your hotel room, or with the hotel reception (get a receipt). Keep a close eye on your personal belongings and hold on to them in public places such as internet cafes, train and bus stations, and crowded public areas. Avoid empty, dark and unlit streets, stairways and parks, especially if you are on your own. 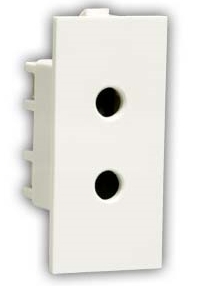 Always lock your hotel doors from the inside, especially at night, Do not open the doors to strangers. It is generally not safe to drink tap (faucet) water in India. Your hotels will provide you complementary bottled drinking water, and you can purchase more anywhere in the city. Fresh fruit juices and salads must also be avoided from places other than known or recommended eateries. Clothing that is not culturally appropriate is best avoided in public places so as not to bring on unwanted attention. Smoking is banned in public places, including hotels and restaurants, except in special smoking zones. Tips are not mandatory In India but always welcome. Radio-taxi drivers do not expect tips and will always give you a receipt for your fare (please remember to demand one). However a small tip (INR 20 to 50) for a short trip or a bit more (INR 50 to 100) for a longer one is always appreciated. At restaurants, and eating places, the service tax on the bill goes to the government. Some also levy a service charge in addition, and it is left to your discretion whether you wish to leave an additional tip. If a service charge is not added, 10% to 15% is a standard tip to leave, depending on the restaurant and the service. Doormen and porters in hotels always expect a tip. INR 20 to INR 50 is a reasonable tip, depending on the service provided. Mobile phones: Sim-cards from different operators are available from local vendors in the city (Airtel, Aircell, Cellone, Idea, Reliance, Tata-Docomo, Uninor, Virgin Mobile, Vodaphone) However, if you are an overseas national, your phone needs to be unlocked, and you need to present identification (copy of your passport front and back pages, and proof of a local address- hotel booking confirmation will do, along with passport size photographs). It also takes a minimum of 24 hours to activate your connection. Mobile numbers have10 digits: 91 XXXXX XXXXX. Click here for more details. 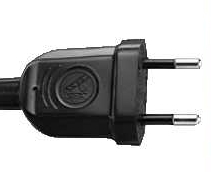 A standard European electric plug (2 round pins) will fit into a power point in India. 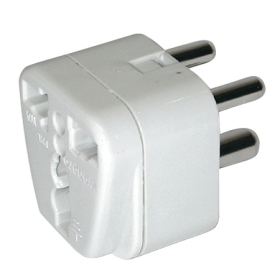 A standard American electric plug or UK plug will not fit into a power point in India, but any electrical store will sell you an adapter (picture below) for around 50 cents (INR 25 approximately) or less. 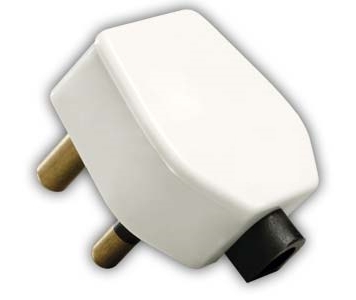 In case you wish to use appliances of 110 volts, please check with your hotel if they can provide adaptors on request, or bring one with you from home. All venues at the Colloquium have wheelchair access. Most of the Colloquium hotels also provide wheelchair access to all areas, and some have special rooms for people with special mobility requirements. However, if you are booking into a hotel that is not on our recommended list, please check directly with the hotel before-hand. Moreover, some of the places visited during the Colloquium social events may not be easy for wheelchairs to access. For any further inquiries, visit the registration desk or email colloquium@cochrane.org.